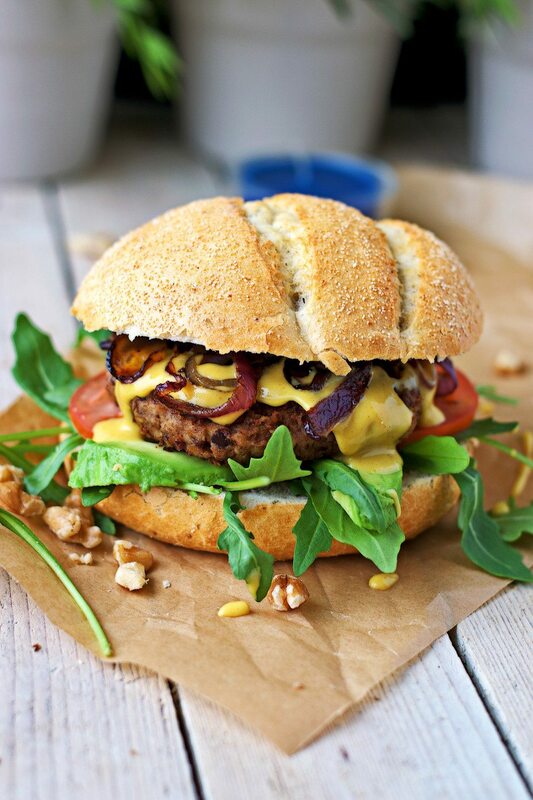 No collection of vegan recipes can be complete without a vegan burger recipe – or two. It takes only four ingredients to make my new Vegan Lentil Burger patty. 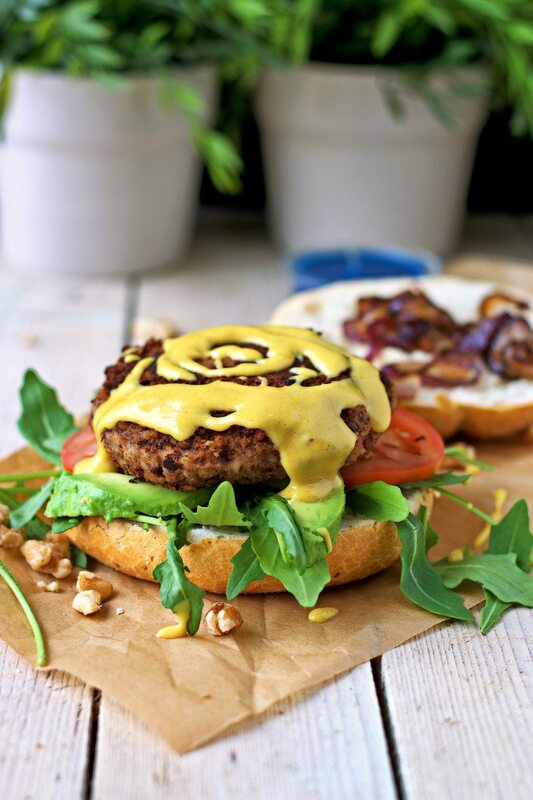 It’s perfect with the sweet and spicy flavors of the creamy Mustard Sauce with Maple I created specifically for this burger. There are a few things that I could never live without: my bed, the sun, good food. And with good food I mean something that fills me and makes me satisfied. At the same time, it should be healthy, too. Sounds difficult? It is not, trust me. But what comes to mind to you first when you think about food that makes you really happy? Sometimes it can be a good bowl of warm soup, especially in winter. Some other times, a fresh, fruit salad. But the one food that always works for me is a stunning, tasty burger, made from fresh ingredients. Whenever I cook, I want to have fun. And I don’t know about you guys but I have lots of fun making burgers. Yes, and eating burgers. But isn’t that the whole point of happy cooking? A combination of fun in creation and enjoying your creativity. At least that’s what drives me to come up with new recipes for Contentedness Cooking. Now the versatility of burger is what makes them also super attractive to me. Simple and delicious, you can combine so many flavors in one sandwich. Depending on your mood, you can make it more hearty, pump up the spices, or give it a stronger veggie note. After my last burger recipe, the Vegan Buffalo Burger based on kidney beans and tempeh, it was the right time trying something new for me: a Vegan Lentil Burger – incredibly delicious and an easy recipe as usual. Do you know my other lentil recipes? Like the Coconut-Mango Stew or my Couscous Lentil Pilaf? They are full of good nutrients, are a good source of plant-based protein and are have a number of health benefits such as low cholesterol, improving heart health, digestive health, increasing energy, and helping with weight loss. If you want to know more about this, check out the post about the “7 Health Benefits of Lentils” on MindBodyGreen. The best thing about the Vegan Lentil Burger recipe – besides its taste, obviously – is that you need as little as four ingredients to make the patties: lentils, raisins, walnuts, and gluten free bread crumbs. A combination of more earthy flavors (lentil) with a touch of sweetness from the raisins and, of course, the nuttily walnut component. Here this is complemented by the special Mustard Sauce with Maple: again a mix of spicy and sweet. But that sauce is not just amazing as a topping for the Vegan Lentil Burger. I also recommend adding about 2 tablespoons of that sauce to the burger patty mixture for an extra flavor kick. You can either bake the patties for the vegan Lentil Burger in the oven or fry them in a pan with a little bit of your favorite oil. For the assembly of the burger: be creative! I used lettuce, avocado, tomatoes, roasted red onions in addition to the Mustard Sauce. Do you like this combination? I’m curious to hear what you think of my Vegan Lentil Burger! You can leave feedback below, or write me on Facebook! Combine the yellow mustard and the maple syrup in a small bowl. Add a pinch of curry if you like and whisk together. If you use uncooked lentils, cook them according to the manufacturer’s instructions. Else rinse the canned lentils. Transfer to a blender. Add the raisins and walnuts to the lentils. Blend until you get a chunky mixture. In a separate bowl, combine the lentil mixture with bread crumbs. Let sit for 5-10 minutes so that the bread crumbs can absorb excess moisture. Form patties an either bake them on the oven at 390°F/200°C or fry them in a pan with a bit of oil (recommended). Use your favorite bun and burger toppings to assemble the Vegan Lentil Burger. I am impressed! I would have NEVER though to put raisins in a burger, but I imagine they are the sweet glue that holds this burger all together. Genius, really! I mean, that burger looks like a hamburger. You could fool more omnivores with this baby, I imagine. And could you PLEASE please tell me your secret for taking such beautiful bright clear photos?!?! I need some lessons!! 🙂 Just gorgeous! You are right Jen, the raisins do help with making the burger hold together. And the add the light, sweet note to it that I like a lot. So gorgeous and colorful Florian!! I make that same dressing, just with chili powder instead of curry! I serve it over Mexican rice and I imagine it would be soooo heavenly on a burger too! 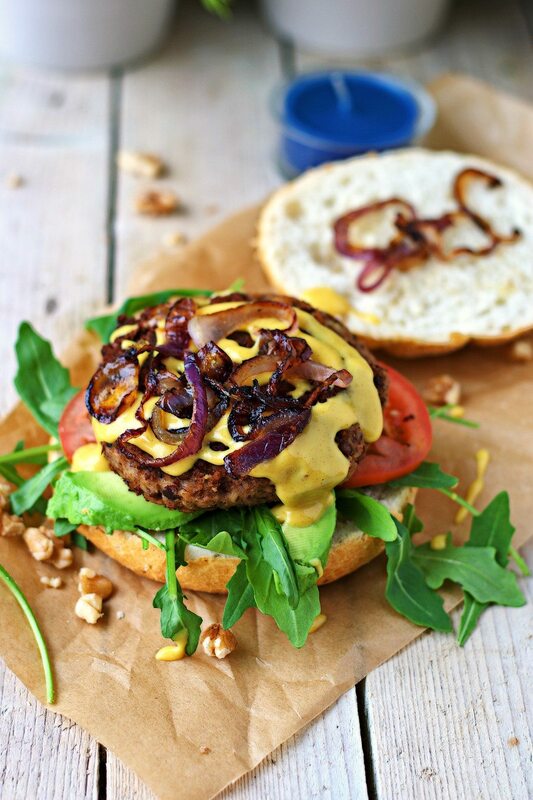 I love that this burger is made with lentils and walnuts, yummy!! I’ve never had a lentil burger before, just a lentil loaf that I make, but I definitely need to try a burger now! I will definitely have to try this because it’s so simple and I would definitely add some good old hot spices and that sauce for lots of flavor, omg, that would be excellent! Love how beautiful it all looks! Thank you again, Brandi. I totally see that adding more hot spices to the burger will rock. I should try this for myself as well. And the idea of having Mexican rice with such a mustard sauce or dressing sounds amazing too. Need to check that out! My wife and I are so into lentils these days. I am all over this recipe and love the sauce. Your recipes are always so inspiring 😀 I could SO go for one of these right now. And the photos, just gorgeous! I love how you styled this baby! I don’t follow a vegan or a vegetarian diet, but how I love lentil burgers. Pinning for later! Love the sound of these! Totally intrigued that they’re made with raisins – definitely a surprise ingredient. I’ve made all sorts of vegan veggie burgers but never with lentils so will have to give this a go : )) Need to also try the vegan buffalo burger too ! yum!! Looks amazing! I normally go the lazy route and buy vegan burger patties but I will totally try this! That is one gorgeous burger! 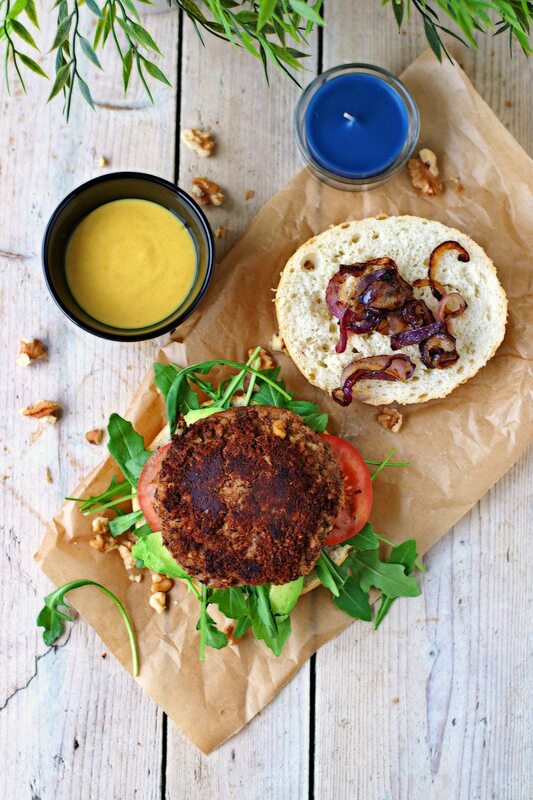 I’ve never had a lentil burger before – I can’t wait to try this one! This veggie burger is just “Wooowww”, I simply love it!! And stunning pictures! All I want right now is to grab the burger through the creen! 🙂 Good job, Florian, I can’t wait to try it! I love lentils, I have got to try this recipe soon, looks amazing! I think your photographs for this came out simply stunning. The mustard sauce that tops this off makes it perfect! These look and sound divine! I want one! These look so, so delicious! Your photos make me want to dive right in. This looks great. How many burgers will this make? Hi Susan, it makes 4 burgers! of it)—so I am ready to make these burgers, as soon as I buy some lentils. Awesome, let me know what you think, Susan! I’ve never seen a more gorgeous burger. And this is coming from a big carnivore who eats a lot of burgers. This is absolutely stunning Florian. It should be on a poster or in a commercial. Just gorgeous. Dude….these burgers are amazing. Thanks for the recipe. Will probably be making a batch every week. Thank you so much for making it and for your amazing feedback! This was by far one of the best vegan burgers we have tried. Thank you so much for your fantastic feedback , Michelle! That means a lot to me! These look so good! will be making them this week! Made these for dinner tonight and wow they are so delicious! Thanks for the recipe! Found your blog through Epicurious last week and I’ve bookmarked tons of your recipes–they all look so good! I finally decided on what to make first 🙂 YUM!! It’s simply the fast and best veggie burger. the kids love and this is one little victory. Happy to hear that! Thank you for your fantastic feedback. Glad the whole family enjoyed it so much. This was nothing short of FANTASTIC and everyone I had over for dinner agreed (and none of us are even vegan). A+++ recipe – thanks! Your comment totally made my day! Thanks so much for your feedback, Kathryn! These came out delicious. I did however, have an issue with the texture. When I fried them they came apart and when I baked them they came out very hard. Any suggestions how to fry them? And how long would you suggest baking them? Also just want to confirm that I made it correctly – you’re supposed to mix the breadcrumbs in the lentil mixture not coat the burgers with them, right? Oh, and the breadcrumbs are indeed to be mixed into the lentil mix. Thanks for the quick reply and detailed feedback!! Like I said these were very delicious – definitely plan on making them again and hopefully getting it right. Thanks for Sharing! Wow, this looks amazing! I’m ashamed to admit that while we have been plant based for over a year, I still haven’t made a from scratch burger. This is gonna have to be it! Let mew know what you think, Rachel! Oh. My. Goodness!! This looks outrageously good, Florian! This burger looks soooo delicious.. I don’t like raisins though, what is a good alternative? or should I just remove it? Hi Nada! You can try dates, cranberries, apricots or just leave the raisins out. Hope it turns out delicious! Hello Again! This burger has become a regular staple in our household, but so far I’ve only pan fried them. Do you have any recommendations for baking (time / temp / etc)? Thanks! Also, I have to tell you how refreshing your writing style is – in a world where so many food bloggers use so much hyperbole and “cutesy” language I really enjoy your straightforward style. Cheers! Hi Eugenia! Thanks so much for your feedback, that makes me really happy! How many burgers does this make? Hi Andrea! It makes 4 burgers! Made it with reallybthick lentil soup and garlic. Husband won’t have raisins so I stirred in red berries, and nooch. Really lovely! Thanks so much for your feedback! Glad it turned out amazing and delicious! Really wanna make this today but I dont hav walnuts or dijon mustard. Wat can i use to subsitute those? Hi Staci! Use any nuts you like! Go for your favorite sauce! I think they would have tasted fine, however they were just crumbly and I felt like they didn’t cook right. Aside from just falling apart they remained just soggy. I waited to put them in the pan until the oil was hot but it did not seem to make a difference. So I am not sure what I could have done different. Hi Kellie! Not sure what happened ! Was your oil hot enough when putting patties in the pan ? If not I would guess that the patties will soak up the oil and then I can imagine they might fall apart. Also make sure not to overprocess the texture, leave some texture. Omg. this is amazing. I just adjusted it a little bit, put almods and dates instead of walnuts and rasins, but it is so amazing. Thank You, Thank You, Thank You!!!! Thanks so much for your amazing feedback and making it! It sounds delicious, yum! Sounds like a fantastic recipe! Going to try them but fry them without oil. Will they hold up with one flip and no oil. I fry other bean burgers without oil and they do fine. Just wondering. Thx. Hi Frances! You need to bake these in the oven! Frying without any oil in the pan will not work, though. Just made these and I baked for 30 minutes. The outsides had a nice doneness but the insides were still wet. What should the interior be like? Nice flavor with raisins and walnuts. Hi Jo! Definitely not this way! I suggest bake them longer or fry them next time! What type of lentils did you use? red? beluga? Hi Marta! I used brown lentils! What would be a substitute for the gf bread crumbs? My son has a wheat and rice allergy (among other things) and everything I’ve found that’s gf has rice flour in it. Hi Sara! I’ve never tried that before, but I could imagine 1/2 cup cooked polenta will do the trick to replace the breadcrumbs. I’m not sure how it will turn out, but I’m curious about your experience. Let me know if you give this a try. I found these today on Pinterest and made them for dinner. I did not have walnuts so I substituted sunflower seeds. My husband and I both loved it! This will become a staple for sure! Thank you for the recipe! Thanks so much for your fantastic feedback, Kelly! Glad it was such a big hit with your husband! that sauce on every salad I eat in the future. Thanks so much for your fantastic feedback, Tanja! One of my favorites! Really hope you’ll try lots of more recipes! This was wonderful! My kids even gobbled this up! I added onion and garlic powders for flavor but did everything else according to the recipe. Thank you for an easy, healthy, and delicious recipe! You’re so welcome, Kirsten! Glad it was such a big hit with your kids! Thanks for sharing your fantastic feedback! I’ve been putting these on the back burner for about two weeks and finally decided to give them a try today. This simple recipe sounded so easy and delicious and it did not disappoint. I did not have regular bread crumbs so I used panko, which made the burgers a little granier and drier than they should have been – TOTALLY MY RESPONSIBILITY! – but I just fried in a bit more olive oil than suggested and they held together and turned out nicely. One thing I will definitely do the next time is add garlic garlic garlic! Gotta have garlic! Other than that addition, this is a go-to recipe. The caramelized onions added a necessary and perfect sweetness and softness but I did not like the mustard-maple sauce. It will be “Just Mayo” for me next time. Thank you, Contentedness! Thanks for your great feedback, Adrienne! You’re so welcome! I just made these for myself and my husband – and wow…. they were amazing!!! I actually cooked them in my air fryer and they turned out perfectly – held together well and the golden, crispy outer of the burger (courtesy of the air fryer) did the trick and gave them a burger-like consistency in the mouth. The sauce was the best surprise – simply delicious! These will be a regular on our vegan menu. Thanks so much for a fantastic recipe. Hi Kylie! Thanks so much for your fantastic feedback! Glad these were such a big hit with you and your husband! I was so skeptical about trying to make something taste like meat… but this came out amazing! I did add a couple more things to it though such as liquid smoke, lawry’s seasoning and Worcester sauce. I found the thinner the Patty and more area to fry, the closer the texture to meat. So excited to share with the husband (an avid meat lover) and the rest of the family! Thanks so much for your amazing feedback, Courtney! One of my favorites! Hi Becca! Thanks so much for your fantastic feedback! Happy it was such a big hit with your family! I just have one question, can I freeze the burgers once done? Hi Valeria! I haven’t tried that before, but I would say why not. Let me know how it goes. Simple template ingredients and procedure. Turned out delicious for me. I used almond instead of walnut. Then I fried them, the first bacth were crumbling apart. Then I changed the thickness of the patty into thicker ones. That solved my problem. I even fried it with too little oil. It came out good. I strained the cooked lentils to remove excess water but too much mustard will also affect its consistency. Another mistake, i coat the patty witg breadcrumbs, lol my bad! Thank you for this simply amazing recipe. 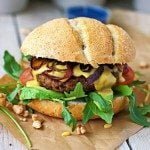 I love burgers, but my wife does not eat meat, so I was very happy when I saw this recipe, now I can cook not only a Burger but also my beloved wife. At what it looks so appetizing that I myself want to try it! Ok, I do not normally leave comments (for good reason 🙂 ), but this recipe was beyond deserving! WOW was this good! I substituted (because I did not have) walnuts and gf bread crumbs with half raw pecans, half raw almonds, and old fashioned oats. I, also, used half raisins and half medjool dates, as I was almost out of raisins. This is, BY FAR, the BEST vegan burger I have ever had. VERY impressive. Glad I doubled the recipe, actually just ate two of them! Worth every star! Will definitely be making these again very soon. Thanks a bunch for your feedback and making it, Michele! That sounds delicious with the almonds and pecans! I’ll have to try next time! Would panko bread crumbs work for this recipe? These are so so sooo good! I was a bit skeptical once I got them in the frying pan, because they were a bit crumbly, but with the right technique, very doable! I just made them again this week (meaning 4 meals this past week) and I already want to make them again! The first time I didn’t use the mustard sauce, because I didn’t have maple syrup and they were delicious, but, man, with the mustard sauce they are even more delectable! Throw some carmelized red onion on top and call it a day! Thanks for such a delish recipe! Well, I got here really late. Do you have any preference as to the color of lentils used? Thank you. Hi Monica! I like brown lentils most! Hope that helps! These are some of the best vegan burgers I’ve ever made. The walnuts and raisins give it amazing flavor and texture. Making them again this week!! Thanks a bunch for your amazing feedback, Danielle! I hope you’ll find lots of more recipes to try!